Educational Program for Kundalini School | Pebble Infotech Pvt. Ltd.
Escaping from our hectic office schedule, we made our way to a small elementary school located on the outskirts of Ringroad. As planned, we (Pebble InfoTech team) gathered at Jorpati and started our journey towards Kundalini School. We made our way through bumpy roads of Narayantar and were stuck in a traffic jam for an hour. After hours of tiresome ride, we reached our destination – Kundalini school. Located in sub-urban area called Naya Basti, Kulandini School is an educational institute with 30-40 students. Upon arrival, we were received by Dr.Ram Poudel – principal of the school. After a short introduction with the school’s teachers, we were escorted towards the meeting room where the students deliberately awaited our arrival. 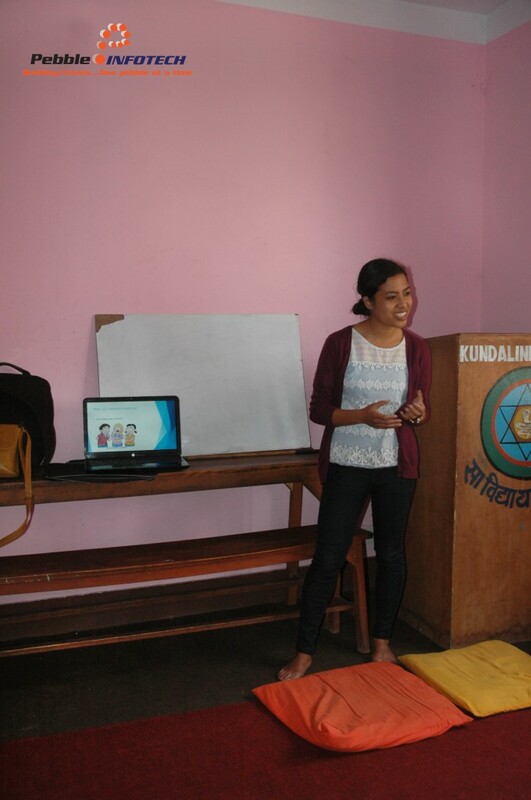 Firstly, Poudel briefed us about the purpose of the institution and how local families are being benefited by the school’s education program. After a short speech from the principal, we were welcomed by an immensely talented gem of the school who liked to call himself Captain. He started off with an introductory speech by explaining the teaching methods and the facilities offered by the school. The speech was interesting and Captain (a small boy from grade 3) had prepared six pages long speech just to welcome us. We felt delighted, as the kids had also planned a musical performance especially for us. They played three traditional Nepali songs including our national anthem. And the most amusing factor was none of musicians performing in front of us had crossed the age bar of twelve. Though small in age, they glibly played complicated musical instruments like guitar, violin and melodica like pros. After a heart whelming welcome, we were ready to share our knowledge with the kids. We started off with a computer class where our WCM expert Elina Lawot highlighted the basic anatomy of a computer. It was a totally new subject for the students because they have no computer classes in their school curriculum. After the computer class, the students were divided into two groups. 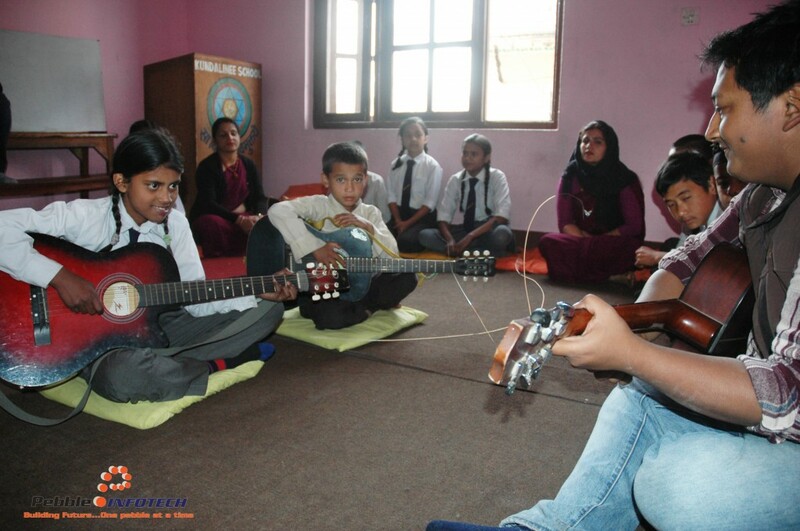 Half of the students’ received guitar lessons from Sujan Joshi and Sudip Bishwakarma. And others were taken to drawing room where Gayatri Chhetri, Anita Dangal, Sanjog K.C. and Saurav Poudel introduced them to the basics of hand painting and paper art. While our experts were busy training the kids, remaining member of our team were steered to a horse riding farm by the school principal himself. After training sessions, the school’s management team catered us with a local snack (Furandana) and a cup of hot tea. After lunch, we presented the kids some stationary items that we had taken along with us. Saying goodbye to the kids was hard, it was even harder when they constantly repeated the words “Goodbye sir” and “Goodbye miss”. Finally, we buckled up and sat comfortably on our seats, in hopes to see their charming and innocent faces again. For our team, it was a completely new experience. We felt delighted to sit amongst the kids and share our view and ideas. These kids were different than the normal kids of Kathmandu valley who were brought up with a silver spoon in their mouth. Their eagerness to learn inspired us to visit the school again, and we are planning to conduct weekly classes for the students. Overall, the trip was exciting, and while we set out to teach these kids about the fundamentals of modern life, they also taught us a valuable lesson that “happiness is derived from smallest things that are scarce in our modern lives”.